I don’t like taking taxis in Managua. I would rather walk 5-6 kilometers in the heat and humidity than take a taxi. Some of that can be attributed to my own personal version of crazy. But there are various other issues, from feeling taken to experiencing my least favorite turn in the passenger seat while a stranger decides when it’s safe to go. I do ride in taxis here, sometimes three times a week. But I prefer to avoid it, when I can. 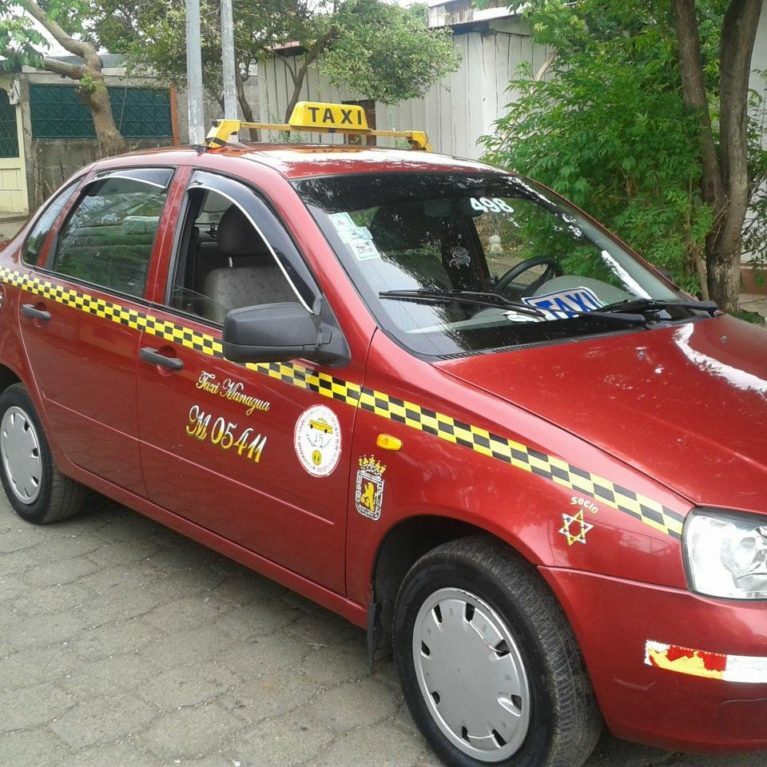 The best taxi rides usually happen when the taxero is friendly and wants to talk a little. I almost always ask how long they’ve been driving and if they like it. The neutral ones occur when they don’t want to talk but we just go straight to my destination safely. Sometimes they pick up another passenger and we take a circuitous route, once or twice I’ve offended the driver and gotten an earful (I do try to learn from my mistakes), and more than once I’ve had a strong hunch that my driver would not pass a breathalyzer/substances test. I do pray a lot on those rides. Then today happened. Raindrops were falling on my head. I signalled, the taxero stopped, I explained where I needed to go, he asked me how much I thought, which might have been a first, then tried to overcharge me. I told him that was too much and offered 20 cords less, which was still more than I should pay, but I’m not here to haggle cordobas and I needed to get to school. He tried to insist and I told him that my offer was already “un precio gringo,” a gringo price, meaning already inflated and an attempt to overcharge me. He accepted my price. I got in. Then I saw the taxero’s daughter. She started talking to me instantly. She smiled at me. She laughed. For the next nine minutes, I fell in love. “Cuantos anos tienes?” I asked. “Cuatro,” she said, holding up five fingers, then four, then five again. “Tres,” the driver told me. “Naomi, Naoooomi, Naomiiiiii!” she exclaimed. Naomi’s father has driven a taxi for 10 years and Naomi has a brother who is 18 months older. The best part of the best taxi ride ever was when her father encouraged her to practice her counting in English. Naomi can count to five, and on five, she gives you a high five. I have had some nice conversations with taxeros. I’ve met a few very strong believers and really enjoyed our brief conversations about God and faith and Nicaragua. I’ve enjoyed several of my rides. But only today was I sad it was over. I tipped enough to give him his original price. I wish I had a picture of Naomi’s smile to share with you, but that would have felt invasive. I’ve just got this image in my mind of her beaming and talking and telling me about the tooth she just lost. You’re going to have to trust me what a beautiful child she is. Now it’s Nicaragua, so everything is a mixture of joy and sadness. * Naomi rides with her dad every day from 2PM to 3PM because her mother gets off at 3PM from her job, so she spends an hour each day making friend and brightening people’s lives (that’s my loose translation of what her dad said). In Nicaragua, the people in the front seat must wear seat belts. If there is a law regarding baby or child car seats, I’ve never heard it nor seen it enforced. Naomi was standing between us the whole way, her feet in the backseat but her little body hovering between the front seats. I’m used to Nicaragua. It will freak you out to know that we don’t use seat belts in the back seats of our cars, but we don’t. Our van–that is not currently running–has one out of the back five that works. I tell you that knowing I’m going to get lectured, but you need to get that this man wasn’t doing anything unusual. We see tiny babies riding on motorcycles between Mom and Dad. We see little ones holding onto Dad’s waist on the motorcycle. I’ve seen a family of five on a motorcycle here. Those scare me much more. But it reminded me today what a bad idea this lack of seat belts is. The same way I feel whenever I see a baby sitting on a lap in the front seat here, which is too often. Every day for an hour going through traffic all the time. Thanks, Lord, for the beam of sunshine you gave me today in Naomi. Please keep her safe in her daddy’s taxi. *Maybe that’s true everywhere. It’s true here. Good thing you and I don’t look too deeply then, isn’t it?